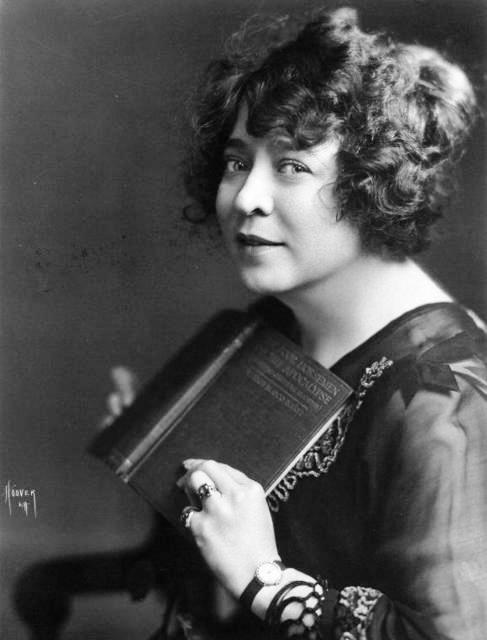 June Mathis, a short, thickset, rather plain woman with frizzy hair, became one of Hollywood’s most influential women during the silent era. 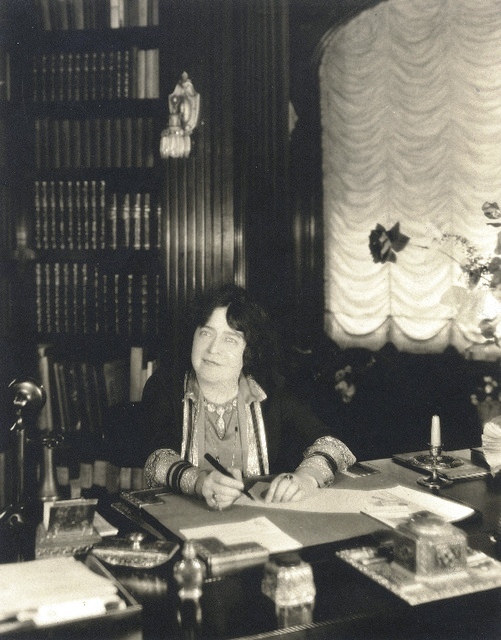 An accomplished screenwriter, casting director and film editor, Mathis was the only female executive at Metro Studios, and at one time the highest paid film executive in Hollywood. Born June Beulah Hughes in Leadville, Colorado on June 30, 1889, Mathis was the only child of Phillip and Virginia Hughes. Although available biographical records usually give her year of birth as 1892, census records appear to confirm the 1889 date. Her parents divorced when she was seven and while much of her childhood is vague, at some point her mother met and married William D. Mathis, a recent widower with three children. Ultimately she would take her step-father’s name. Mathis’ first public incarnation was as a child actor in vaudeville and on Broadway. Her stage credits include the hit play, The Fascinating Widow with the famed female impersonator, Julian Eltinge. For thirteen years Mathis toured in numerous plays and vaudeville shows. In 1914, she moved to New York and took a writing course and entered a scriptwriting contest. This brought her several offers to write scenarios until Metro Studios hired her in 1918. At Metro, she quickly worked her way up to becoming chief of the studio’s script department. 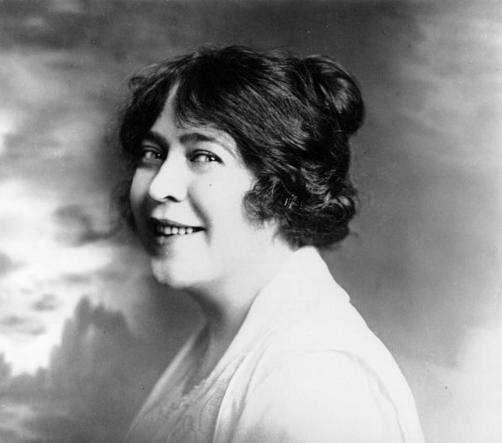 Her scripts incorporated a wide range of films including An Eye for an Eye (1918), Hearts Are Trumps (1920) and Polly with a Past (1920). .. When Metro president Richard Rowland bought the rights to the popular war novel, The Four Horsemen of the Apocalypse, Mathis was placed in charge. It was through her influence that her friend and fledgling film director, Rex Ingram was hired as the film’s director. The film and the casting of Rudolph Valentino in the role of Julio, established both of their careers. 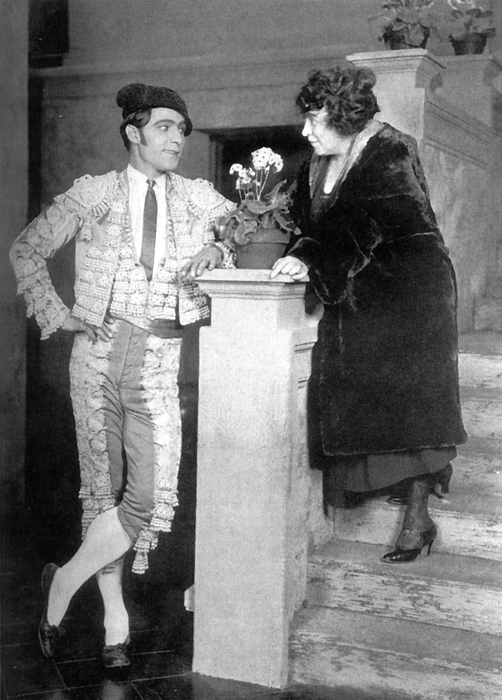 Mathis picked Valentino for the role of Julio after seeing him in a small role in The Eyes of Youth (1919). Until Mathis cast Valentino in The Four Horsemen, he was relegated to mostly bit parts and walk-ons. Several people have taken credit for Valentino’s success but it was this bit of casting that launched the Latin Lover’s career. At Metro, and later Paramount studios, Mathis was responsible for a string of Rudolph Valentino films including Blood and Sand (1922) and The Young Rajah (1922). Mathis and Valentino maintained a very close relationship – some even suggested that they may have been romantically involved, but this is unlikely. In fact, actress Nita Naldi said that Mathis mothered Valentino and that they held each other in high regards. When Mathis’ version of the script for the ill-fated The Hooded Falcon failed to impress either Valentino or his wife, Natacha Rambova, Mathis ended their relationship. After negotiations with producers of the Ben-Hur stage play, Samuel Goldwyn bought the screen rights to General Lew Wallace’s religious novel. Mathis, who had previously been with Metro and Lasky, was now Goldwyn’s head scenarist and was given sovereign control. Not only would Mathis adapt the screenplay, she was in charge of production and her first executive decision was to make the film in Italy. After a nationwide search it was decided to go with Mathis choice for Ben-Hur, George Walsh and her pick for director, Charles Brabin. Neither choice, however, was popular with the public nor with many in the film industry, but this proved how powerful Mathis was at the time. Once the film company arrived in Rome, the production quickly began to deteriorate. Labor disputes delayed the building of many of the sets; Italian labor was inexpensive, but slow. Not only were the sets and costumes not ready, but the actors sat around or took advantage and made small tours of Europe. To make matters worse, Mathis was told to not interfere with Brabin on the set. Originally she believed that she was to supervise the production, but quickly learned that things were changing; Brabin would only allow her to approve or reject changes to the script. In the meantime, nothing on the set seemed to go right. The sets cost a fortune but still looked cheap. The script wasn’t completed, and a lot of time and money was being wasted. The moral of the entire company was at an all-time low, and it appeared that Ben-Hur would be the biggest fiasco that Hollywood had ever seen. During all of this, Metro, Goldwyn, and producer Louis B. Mayer were making plans to merge their studios. The first point of order for the new studio, now known as Metro-Goldwyn-Mayer, was to try and save the fast-sinking Ben-Hur. Mayer, who was appointed as the head of the studio, told MGM’s president, Marcus Loew, that he would only take the job if June Mathis, Charles Brabin and George Walsh were removed. They also insisted that the script be rewritten. These demands meant that they would have to start from the beginning. Mayer’s replacement for Brabin was director Fred Niblo, who felt the assembled cast was the most uninteresting and colorless he had seen and directly blamed Mathis. Walsh was replaced with Ramon Novarro and Mathis was unceremoniously fired and replaced by scenarists Bess Meredyth and Carey Wilson. In statements to the press, Mathis held Charles Brabin responsible for the problems on Ben-Hur. She insisted that control of the picture was taken away from her by Brabin and she could no longer associate herself with the film. During the few months that she was in Rome, Mathis met and fell in love with Sylvano Balboni, an Italian cameraman hired to work on the film. Mathis returned to Hollywood in August 1924 with Balboni in-tow, and married him the following December. Regardless of what transpired on Ben-Hur, Mathis continued to work. Shortly after returning from Rome she signed with First National where she scripted several Colleen Moore films including Sally (1925), The Desert Flower (1925) and Irene (1926). .. When Rudolph Valentino’s last film, The Son of the Sheik (1926) premiered in Los Angeles, Mathis was there and the two had a heartfelt reunion. 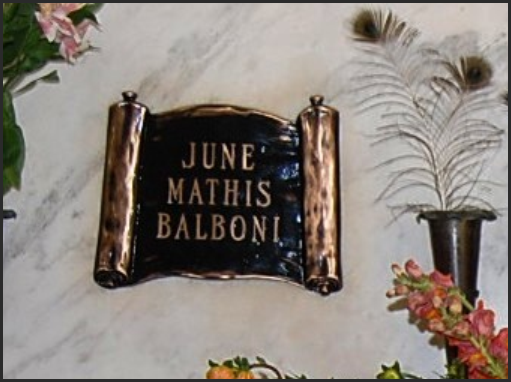 It was only a few months later that Valentino died suddenly and Mathis offered her own crypt at Hollywood Cemetery as a temporary resting place for the dead film idol. Over the following year, Mathis developed health problems, including high blood pressure and was placed on a restricted diet by her doctors. That summer, she was in New York with her grandmother, Emily Hawks. On the evening of July 26, 1927, disregarding her doctor’s orders, she had a heavy meal before taking her grandmother to the 48th Street Theatre to watch Blanche Yurka perform in The Squall. In the play’s final act, Mathis suddenly cried out, “Oh, mother, I’m dying,” and threw her arms around her grandmother while sobbing convulsively. Attendants ran to Mathis seat and carried her outside to the theater alley alongside the playhouse and laid her on the concrete road. A physician that was in the audience examined her and announced that she was dead. Her grandmother was inconsolable, pleading with her to speak while Mathis’ body lay in the alley waiting for the medical examiner to arrive. The following week back in Hollywood, Valentino’s body was moved to the neighboring crypt to make room for Mathis. They lay next to each other in eternity to this day. . While it’s true that only hard-core film enthusiasts recognize June Mathis’ name today, she hasn’t been totally ignored. For instance, you cannot mention Rudolph Valentino, director Rex Ingram or such film classics as The Four Horsemen of the Apocalypse without discussing Mathis’ and her contributions to film history? Without a doubt there have been a number of women among Mathis’ contemporaries who yielded various levels of power. These would include writers Frances Marion, Bess Meredyth and Anita Loos and of course directors Lois Weber and Dorothy Arzner, among others. For some reason, shortly after the advent of sound, women seemed to lose much of their influence that they achieved during the silent era. The only women that seemed to wield any power were gossip columnist Hedda Hopper and Louella Parsons, who, while not directly running a studio, could definitely influence the powers-that-be. Today it’s not unusual to see a woman in a position of authority or even running a studio. Examples over the years have included Amy Pascal, Chairman of Sony Pictures; Anne Sweeney, president of Disney-ABC Television; Gail Berman, president of Paramount Pictures; Stacey Snider, co-chairman and CEO of DreamWorks SKG; Nina Tassler, president of CBS Entertainment; Dana Walden, President of 20th Century Fox Television, and of course, there’s media mogul, Oprah Winfrey. June Mathis would be proud.